Small communities are spread across the reservation, Rocky Boy’s Agency area and in Box Elder. They are tiny and limited for services. Approximately 27 miles north of the reservation is the town of Havre, Montana, where one can find modern shopping, chain supermarkets, gas stations and so on. Havre also has quite comfortable and affordable housing. 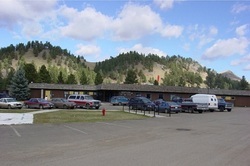 The Tribal Health & Human Services are located in the Rocky Boy Agency area. Pharmacy, Physical Therapy). AAAHC accredited. Housing is located near the clinic complex. Availability fluctuates depending on vacancy. Housing is assigned on an individual basis. The homes are two and three bedroom homes. All are within walking distance of the clinic. Occupants are responsible for rent and utility costs. Staff also can elect to live in Havre which is 27 miles north of Rocky Boy. Local realtors in this community can be contacted regarding rentals or purchase of homes. prosper the Tribe in the future.